Propaganda war precedes and accompanies all conflicts – notably when US-led NATO and Israel wage naked aggression. The so-called US coalition in Syria and other countries is largely a Pentagon operation with a little help from Washington’s imperial friends, mainly Britain and France. The US partners directly or indirectly in all Israeli wars of aggression against neighboring countries and Palestinians. Civilian casualties are inevitable in all wars. US-led NATO and Israel terror-bomb targeted countries and communities indiscriminately. Israel openly admits it, collective punishment its official policy. The IDF’s Dahiya doctrine reflects it, named after the Beirut suburb Israeli forces destroyed in 2006. The same strategy applies to Gaza and other Israeli aggressive attacks. It’s how US-led NATO operates – why millions of casualties occurred post-9/11 from war, related violence, untreated wounds and diseases, starvation, and overall deprivation. In Syria alone, US-led NATO, Israel, and their terrorist foot soldiers are responsible for hundreds of thousands of casualties, the toll mounting daily. Russian and Syrian aerial operations are targeted, not indiscriminate, to minimize civilian casualties as much as possible. Claims otherwise are fabricated by Washington, its imperial partners, and the so-called UK-based and funded Syrian Observatory for Human Rights (SOHR). The one-man propaganda operation is run by Rami Abdulraham from his Coventry, UK home – earlier admitting he hadn’t visited Syria in over 15 years. His operation is all about producing material fed him by his handlers, distributed to Western and other media outlets. No one has a precise death and injury toll, at best a close approximation. SOHR’s numbers have no credibility. Its dubious “sources” are unnamed. Not a shred of evidence suggests Russian and Syrian aerial operations indiscriminately bomb civilian communities, hospitals and infrastructure – a US-led NATO/Israeli specialty in all their wars of aggression. Washington and its imperial partners pretend to be combating the scourge of ISIS they arm, fund, train, direct, and otherwise support – along with other terrorist groups in Syria and elsewhere. Russian intervention turned the tide of battle from likely defeat of Syrian forces to hoped for eventual triumph. It’s unattainable with Idlib province controlled by US-supported terrorists, along with Pentagon occupation of northeast and southwest areas, and Turkey controlling Syrian territory bordering its country. Months of US-led terror-bombing of Mosul, Iraq and Raqqa, Syria alone massacred tens of thousands of defenseless civilians. 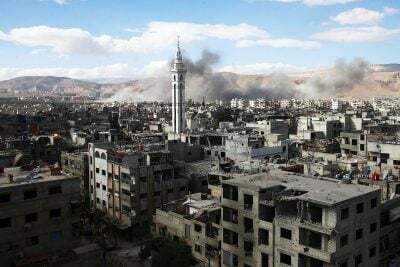 Throughout the Syrian conflict since March 2011, its Foreign Ministry sent numerous letters to the UN secretary-general and Security Council president, condemning US-led terror-bombing of civilian communities and infrastructure – to no avail. US-led support for ISIS and other terrorists, along with aggression in Syria continues endlessly. Washington came to the country to stay. Conflict resolution remains unattainable so far because the US and its imperial partners reject it – pursuing their goal of regime change, no matter the growing human toll. Since intervening in September 2015, Russia has been falsely accused of indiscriminately killing civilians in Syria numerous times. Its Defense Ministry and Putin spokesman Dmitry Peskov strongly deny the fabricated claims. Months earlier, Peskov called accusations “unfounded. It’s unclear what they are based on. No particular data has been provided, and we assess these accusations in this way” – rejecting them.